Many traditional, family owned businesses in the Middle East are taking on external investors and partners and many are experiencing tension and conflict around Corporate Social Responsibility strategy and implementation. External investors and partners are pushing for a more strategic, mutually beneficial approach to corporate social responsibility, societal and community engagement. Islamic business has a long standing tradition of supporting people and communities that has evolved from the Islamic principles of Zakat and Sadaqah [while Zakat is obligatory, Sadaqah is voluntary]. 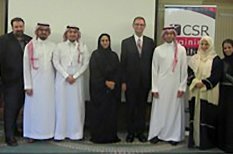 CSR in the Middle East has traditionally taken more of a philanthropic or charitable approach; a transfer of money and resources from business to social needs and issues with limited attention to sustainable impact or business value. The philanthropic focus and recipients have generally been driven by the charitable interests of the families that own the business, rather than the strategic needs and opportunities of the business. For the ownership families there is often a close personal and family connection with the causes supported and the charities and organizations that are involved. New partners and external investors seldom have the same connections with the charities and causes and look to see more strategic, mutually beneficial approaches to social responsibility and community engagement. This is leading to internal tensions and putting managers and leaders in difficult positions. While there is no one-size-fits-all approach to resolving these issues a systematic value-focused analysis [basically a CSR SWOT (strengths, weaknesses, opportunities and threats)] can provide a solid platform for developing effective go-forward strategies. A CSR SWOT can help any company to be more effective at meeting societal obligations and expectations and, importantly, at integrating them with shareholder expectations and interests. This applies to all businesses. It isn’t just family owned Middle Eastern businesses that fall into a pattern of blindly supporting societal causes and issues without periodic review and assessment. This happens to businesses of all sorts and from all over the world. Executives and managers have elaborate systems in place to analyze business priorities, budgets and activities. But, seldom does corporate social responsibility and sustainability get subjected to the same regular scrutiny and analysis. A CSR SWOT can be a smart investment for most businesses, including Middle Eastern businesses where there is tension between founding families and external investors and partners over the focus and extent of CSR priorities, activities and budgets. For more on CSR SWOTS see an earlier post CSR SWOT – discover risk, value and more or contact me directly.